What EDMs say about MPs' attitudes to games. A couple of paragraphs I worked up for PC Gamer, for a forthcoming article, but I didn’t end up using. The reasoning behind the tax-breaks was to counterbalance the incentives other English-language countries have; Ireland’s very low corporation tax, for example, or Canada’s huge tax credits (where companies can get 40% of their employee’s salaries back) and high salaries are a brain drain, meaning many UK developers go abroad to work. Canada isn’t just luring developers with lumps of cash. The usual obstacles of cognitive dissonance, that governments would rely upon for keeping skilled workers in the country, just aren’t there for many developers, especially graduates and Indie developers; staying near family, familiarity with how things work, useful networks; they matter, but not as much as ‘making it’. Moreover, for quality of life Canada’s always listed in the top ten countries All things being equal, Canada would be a great place to move to for a developer; as it is, they’d be stupid not to be looking for jobs there. As any good economist can tell you the easiest way to counteract a tariff or a subsidy, is to set one up yourself – and taxing foreign-made games would be far too contentious, so it has to be a subsidy – which, because of world trade law, is easiest disguised as a tax-credit. As Eidos’ Ian Livingstone pointed out at the GamersVoice meeting, without such a credit, British game development has fallen from 3rd in the world to 6th. So why did they scrap them? The coalition minister David Gauke has said there is no evidence of market failure, that tax relief artificially distorts markets, and that under EU regulations such tax breaks would be illegal state aid – all good arguments if true, and all equally applicable to the UK film industry which receives £110m a year in subsidies. I agree there hasn’t been market failure – but having a working market never used to stop politicians intervening (look at the endless subsidies to the rail companies), so why not games? Meanwhile Canadian tax relief is already distorting the market – so much so that France is already subsidising its industry, meaning the UK is unlikely to get prosecuted by the EU if it brings it in. So what’s the real reason? The reason Keith Vaz is a such a target for our ire, is that the man often seems maliciously ignorant and has misled his fellow members. After the dreadful anecdotal nonsense of the BBC’s Panorama ‘investigation’ into video games, an Early Day Motion (pretty much an open letter from MPs) sponsored by Vaz amongst others, attracted 15 MPs signatures “That this House notes with concern the findings from BBC’s Panorama investigation that video games have addictive properties”, despite the programme proving no such thing. In fact, there are many such motions from Vaz, nearly all of them involving sensationality and anti-games. Having gone through all the video game related EDMs, I can reveal he did one for the Malmo shootings, which he blamed on Counter-Strike (10 signatures), one about games being violent (26 signatures), one about Rapelay (42), Madworld (26), Modern Warfare 2 (13) and many, many more. He’s a one-man smear campaign. Vaz, just so you know who we’re dealing with, has been investigated several times over corruption (the Hindujas), has served a rare suspension from Parliament for misleading the police, and is a proponent of provably ineffective homeopathy; yet his loyalty to the government was rewarded with a prestigious committee chairmanship and his appointment as a privy councillor. So it goes. 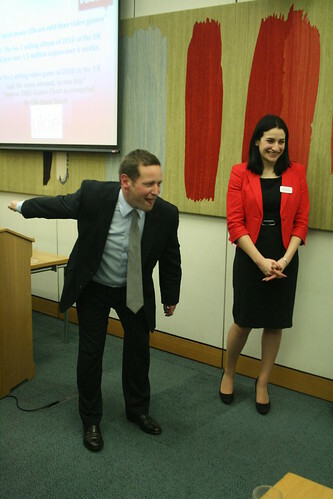 However, there are other MPs on-side; if you live in either Dundee or Nottingham, your MPs are mostly games-friendly. There were friendly EDMs from both Ed Vaizey and Tom Watson, which attracted 30 or so signatures each. That said, there are still around 600 MPs who haven’t committed themselves one way or another – they’re the ones we need to capture, and persuade. Next Post Next post: Interview: Gareth Garratt, disability campaigner.